So after I made the light and airy pretty pink cap for a small child, I had a go at making another one except larger. 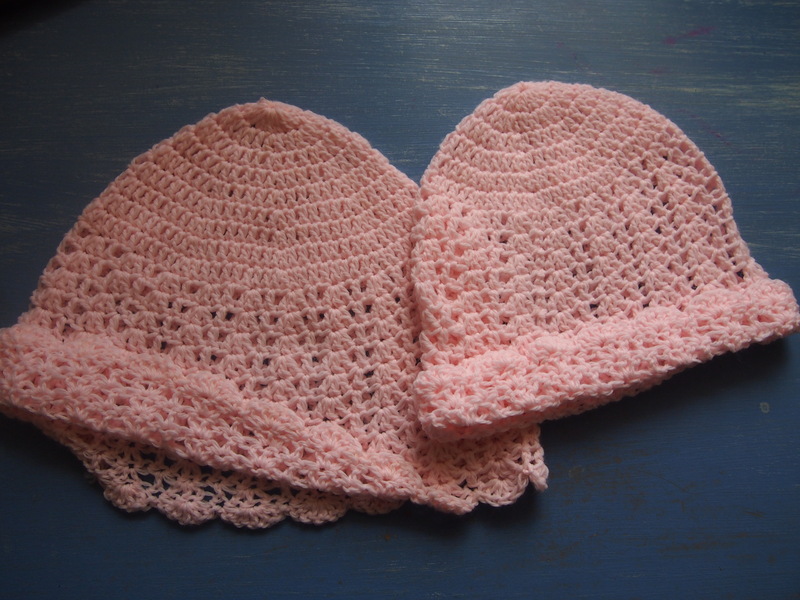 But I ended up making it too large, so now I have a matching pair of pretty pink mother daughter caps. This large cap has 9 increasing rows, 11 rows of shell pattern and one round of scallops at the edge. It’s a bit on the large side, it probably should have 8 increasing rows, not 9. I used the same silky soft pink yarn for both caps, and the 4mm hook, and the same pretty shell pattern I like, inspired by the doll’s dress my grandmother made. The shell pattern is 2 ch sk 1, 3 dc, sk 1 (1 dc, sk 1, 3 dc, sk 1) repeated to end, sl st. I finished the adult size pink cap on Thursday. I’m not sure who might like this mother daughter pair, but I have some ideas! 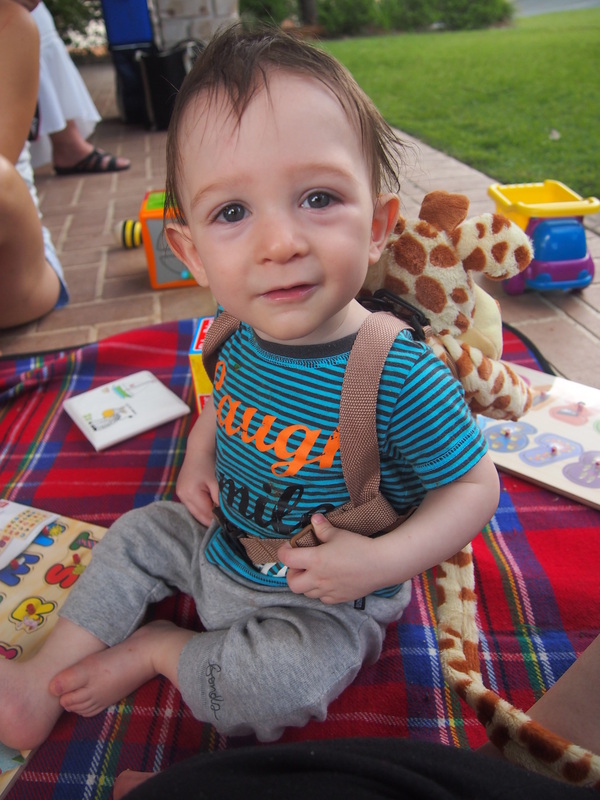 I did a little research before organising my son’s first birthday party and I must say I’m really surprised at the level of pressure out there to perform when organising this event, when personally I find that very unnecessary! Themes? Seriously? You don’t need that. For goodness sake, talk about stressing yourself out when you don’t need to! I just strung up a couple of balloons with some recycled ribbon! 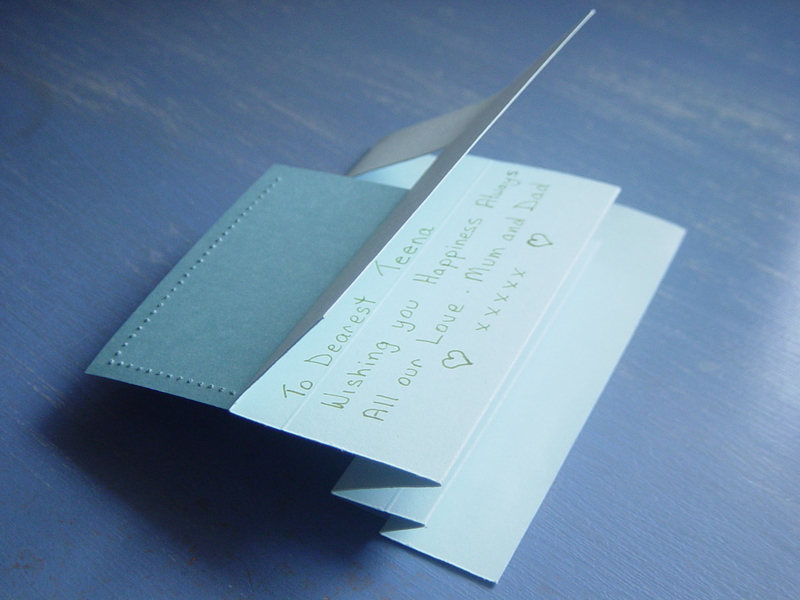 Prettily printed invitations sent in the snail mail? Come on! Just email your friends, easy! Thankyou bags? Maaaybbeeee, if you really want to, but doesn’t that make it all a bit too formal? I’d rather have a relaxed affair where the mums and babies can have a good time. Well, I hope my friends had a good time at our party. We just had it at the pool area of my gated commuity, where there was plenty of space. I could have invited more people, several did say they wanted to come. But I was worried about the weather forecast which predicted rain, then we would have to all cram into my small house, which would have been ok, but not as nice. Luckily, it didn’t rain. But I do think it’s nicer to have smaller gatherings, then I can relax too, and get to chat to everybody. If I had everyone over on the same day, it would have been far too rushed and hectic, and I would have worried about neglecting some of my guests. It was far nicer, for example, to have my brother and family visit on the previous Sunday so we could hang out as a family without a bunch of people they didn’t know. One dilemma I did have was the question of gifts. If you read my blog, you might know I’m not really keen on our tradition of gift giving. But I don’t want to be a kill joy either, nor do I want to offend my friends and family. So I did some research on this topic and discovered in some forums, that some people have quite a passionate opinion on this. I would have preferred to have said in the email ‘please, don’t bring gifts’ but in my experience, that never works and some people always bring gifts anyway, no matter what you say. I found some people find it really sad and it takes the fun out of it for them. I also read that it was polite etiquette not to mention gifts at all, that to say ‘no gifts please’ implies that people should bring gifts, which some people think is rude! My husband was home from work on holidays, so we decided we would put some nice nibblies on for the grown ups, and I decided not to mention gifts at all. That way, if people wanted to bring gifts, it was up to them if they wanted to, and at least we put on some food as a thankyou. I do think that if people bring gifts, they shouldn’t have to bring food as well. It’s not that hard to put on a bit of food. My husband baked some pesto and sweet chilli scrolls, marinated chicken wings and rosewater biscuits which were very popular. I made up a fruit platter and some dips with crackers. To further reduce stress, I tried to open gifts as guests arrived. This way there would not be a big parade of gifts everyone has to sit and watch, which I don’t like. Unfortunately, I didn’t quite manage it as three mums arrived at the same time when we were busy, so we opened their gifts after we did the cake ritual. 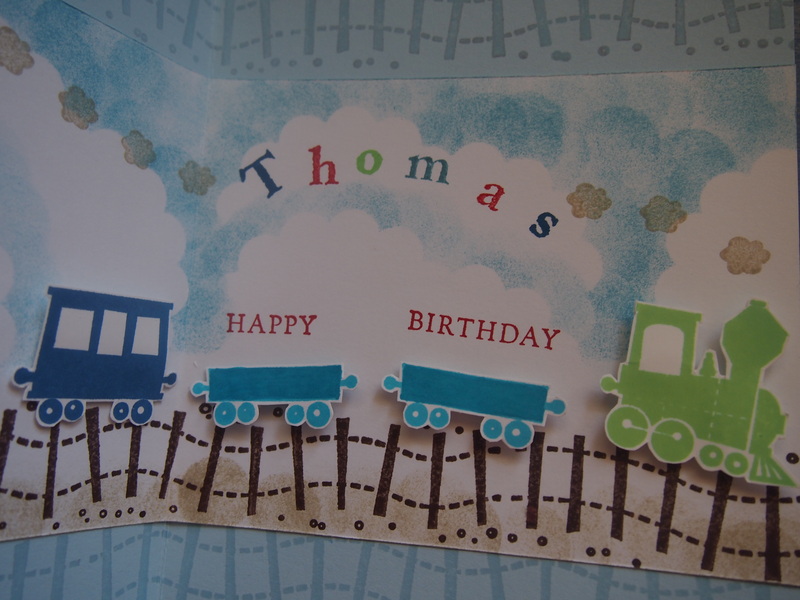 The fun thing is, I now have presents to make for 5 more babies as they all turn one soon, because Thomas was the eldest in our mothers group! I’d highly recommend a cake like this, not just for a 1st birthday, but for older children as well. There are two great things about this kind of cake. 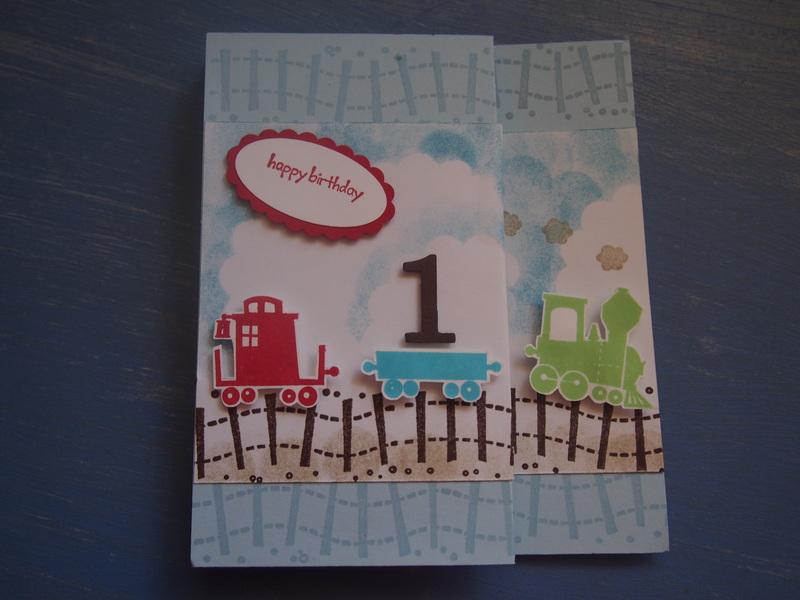 First is, it’s fairly easy to make and decorate. Secondly, there is no cutting of the cake, nor plates and napkins to organise. Guests simply grab a cupcake as they wish! My husband made the cupcakes using coloured cupcake papers in a muffin tray, and a chocolate cake recipe. Then I iced them using the icing recipe on the pure icing packet. I even got blisters on my thumbs from mixing it, that’s a dedicated mum for you! 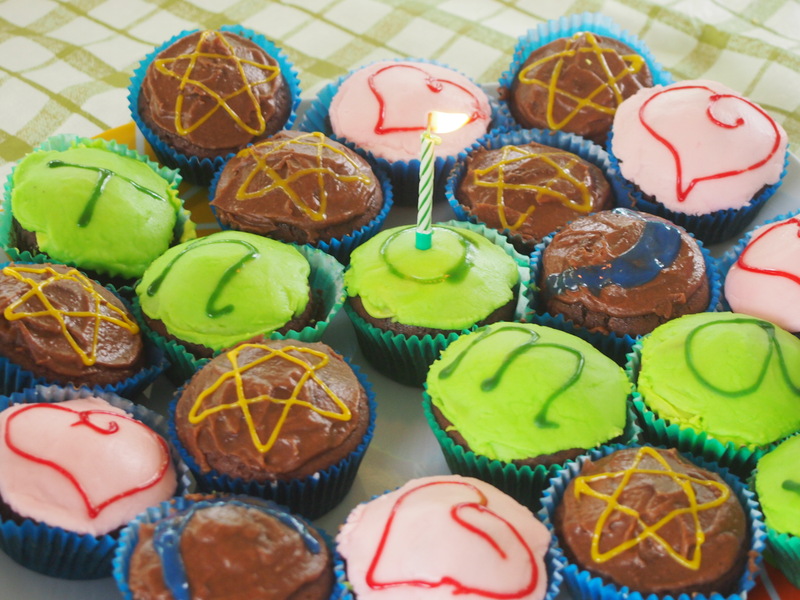 Then I used writing icing in bright colours to decorate the iced cupcakes. I highly recommend that product because it was so easy to write his name, I just needed a steady hand and sat calmly on a stool at the kitchen bench. 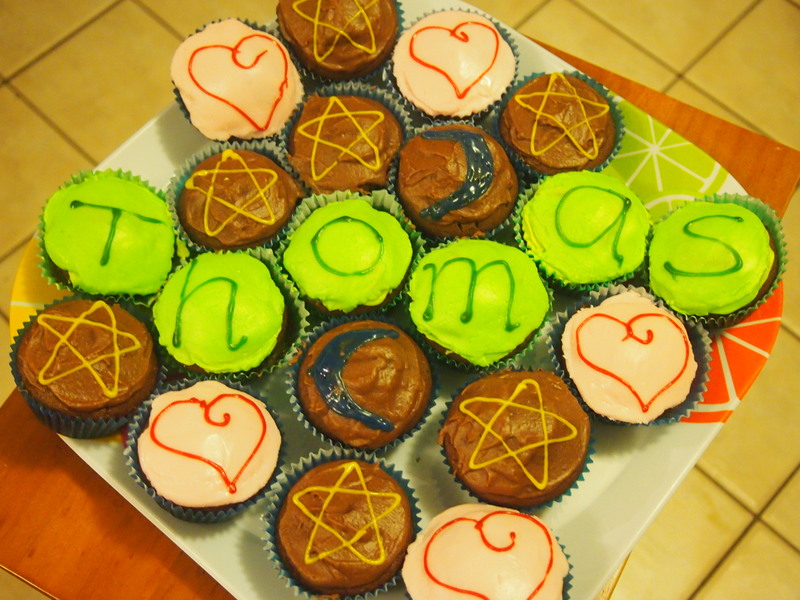 It was easy to simply put one letter of his name on six cupcakes, making the cake nice and personal. On a whim I decided to decorate a few with pink icing! I decided there was nothing wrong with having pink icing on my son’s cake, especially his first birthday cake, as it was us who were celebrating, and as his mum I decided I needed some pink! 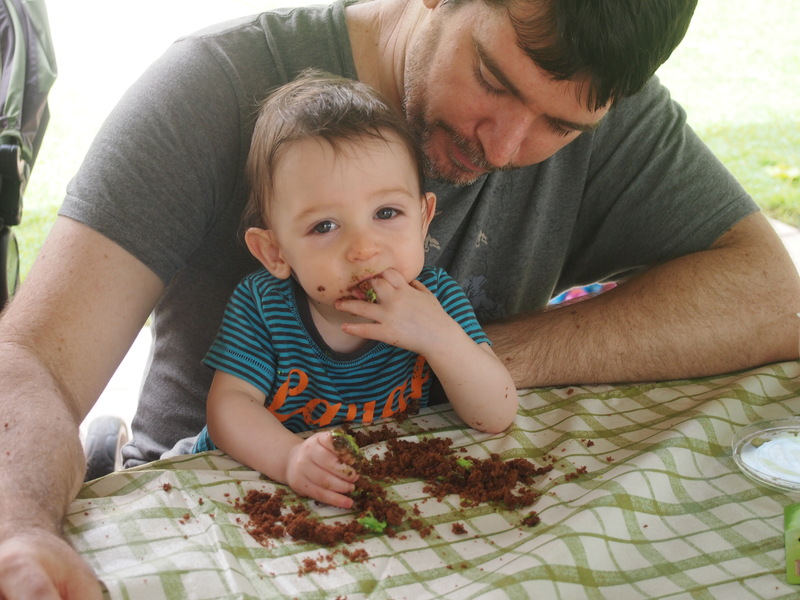 It has certainly been a hard year that I am glad to put behind us.I’ve been looking forward all year to seeing Thomas eat a chocolate cupcake on his first birthday. For a couple of months there I was worried he wouldn’t be able to do it. Feeding my baby and making sure he ate enough has been my main worry all year, although he’s never been technically underweight he’s always been a small baby and small eater. I was so happy when he finally devoured his cupcake for all to see, making a very big mess! Surprisingly, or perhaps not so, the pink cupcakes went first. Most of the guests were mums, and we all like a bit of pink sometimes. They were very, very yummy!! This rug started off as a pile of scraps given to me by my mother last year, and is now the second rug like this I’ve done. I’m hoping it will be a useful rug for Thomas. I really enjoy making these rugs. The material is not expensive, you can pick it up at op shops or find it in your own craft cupboard, and it’s satisfying to turn balls of left over yarn into something that can actually be used. I enjoyed making the first one so much I called it a ‘therapy rug’! There’s no pattern to the colours, the only rule is whenever I change yarn it’s a different colour to the last. It’s therapeutic because there is no stress at all about the design, it just comes down to a decision at the moment it’s time to pick a new colour. And the idea of these rugs is to use up all of that left over yarn, that’s why there are not finished rows, rather they run into each other like spirals until the yarn runs out. 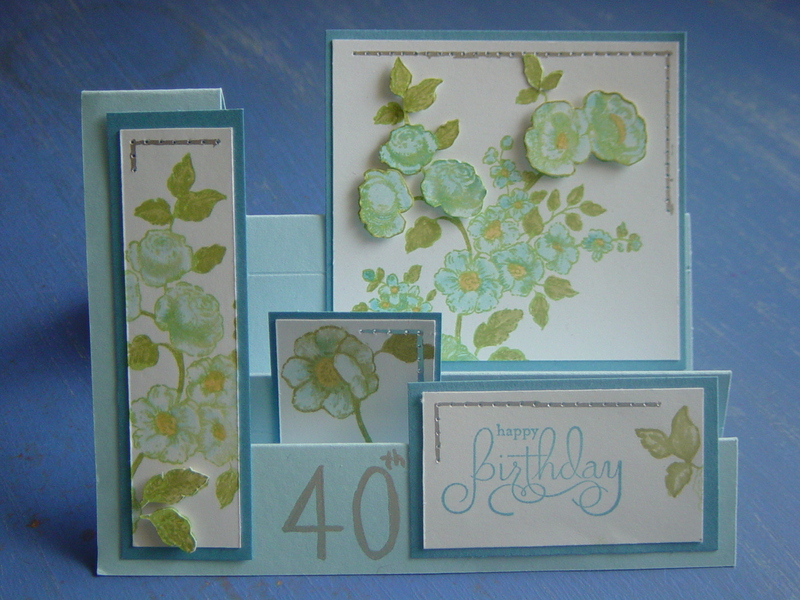 Then I choose a contrasting colour to continue. This way there are no little bits left over at all. That’s why this is much better than making a rug out of small granny squares sewn together. And I find sewing all those squares together at the end very tedious! For this rug, I used a 4.5mm hook, so not too small so it doesn’t take too long. The first thing to do is sort the balls of left over yarn according to size. The very smallest ball of yarn is the one you want to start with, next choose a contrasting colour that looks to be amongst the smallest of the balls left. I’ve even resorting to weighing the balls on a small kitchen scale! This way you get the spiral effect. I’m rather proud how this one turned out, the pattern is quite nice considering there was little planning in it. It’s good to know I have something useful to do with all those annoying left over balls of yarn! Happy Mother’s Day to all mums, now including me! David made me pancakes for breakfast with a scrummy berry sauce, and Thomas did his bit by being very cute! All the beanies I’ve made so far are too small for Tom, yet it’s starting to get cold and I think he needs to wear one. So I made this one this morning, using 100% Australian merino wool and a 4.5mm hook. I usually use the 4mm hook but the bigger hook made it slightly bigger, I also added an extra increasing round. So this hat is a bit on the big side, but he’ll grow into it! Now he can keep warm in this cold weather, and I’m feeling like making him some more beanies now I know his size!